Reporter Brett Walton recently visited the plains states of Kansas and Texas, finding a difference of opinion on how to best use limited water supplies. Soybeans harvested by a combine are funneled into a truck that drives parallel to the machine on a field in Thomas County, Kansas. Click to enlarge image. The shortgrass prairie in western Kansas was alien land to the pioneers who had been reared in the humid, woody eastern United States. In the early antebellum days of westward expansion, some explorers wondered if modern man even belonged on the spacious plains. These words by Major Stephen H. Long, leader of the first U.S. military expedition to the plains in 1820, are emblazoned on a plaque in the Panhandle-Plains Historical Museum at West Texas A&M University in Canyon, Texas. The museum was one of the last stops I made on a recent reporting trip through the Great Plains, driving from northwest Kansas to the Texas Panhandle. But contrary to Long’s sentiments, civilization does exist here. Families, towns, and businesses are able to make a decent living, having lashed themselves to a highly integrated grain-and-cattle economy and a way of life that was made possible because early settlers eventually found water. They found it not in rivers — which flow sporadically here, if at all — but underground in the Ogallala Aquifer, the fountain of prairie life. Starting slowly at the turn of the 20th century and then with increasing vigor after World War II, thanks to big machines and cheap fuel, farmers pumped and pumped and pumped from the aquifer to compensate for erratic rainfall that is insufficient to produce agricultural prosperity. “Without irrigation this community would dry up and blow away,” Stuart Beckman, a farmer from Thomas County, Kansas, told me in his combine as he harvested soybeans, his words perhaps influenced by the 25-mile-per-hour winds that were raking the fields in the late afternoon. That the Ogallala might one day cease to be has been apparent since the late 1960s. Because of topography and climate, almost no water enters the aquifer, while billions of gallons are pumped out each year. Since those first reports of a rapidly falling water table, farmers in this region have changed the way they do business, so that they might keep farming longer. New irrigation technologies and land-management practices that conserve soil moisture have helped the bottom line, both economically and environmentally. Yet the water will not last forever. In practice, it is more like a reservoir of oil than a lake. (U.S. tax law even treats it that way, allowing landowners to depreciate the depleting water.) Today, the quandary on the plains is how best to use the water and when: For corn or wheat or cattle? Today or two decades from now? 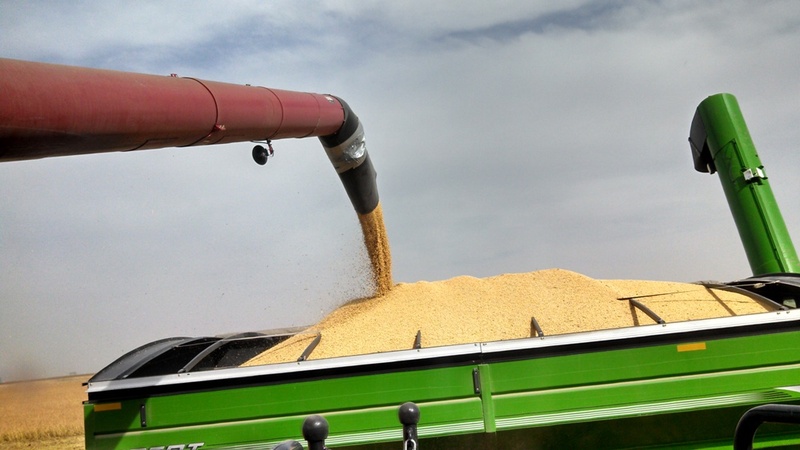 Meanwhile, with harvest season in full swing, grain is bursting from the Western Plains and farmers are asking themselves and their neighbors how they should use the finite water resources and how those choices affect their economic future. During my week in the field, I found that new ideas are butting up against well-entrenched historical legacies. It’s a story of uncertain adaptation that I’ll tell soon here on Circle of Blue. Have any good Great Plains farming stories or experiences with the Ogallala Aquifer? Send a tweet to @waltonwater, comment below or contact Brett Walton directly.